​​ DALLAS - Developers have filed permits to build one of the tallest buildings started downtown in almost two decades—a 40-story residential tower in downtown Dallas' Arts District. Along with the 416-unit apartment tower, which also is to include retail and restaurant space, the project will include 52 artist's lofts in a low-rise building fronting on Flora St. The $132 million planned apartment tower at Flora and Olive streets is right next door to the Museum Tower and a block south of Klyde Warren Park. 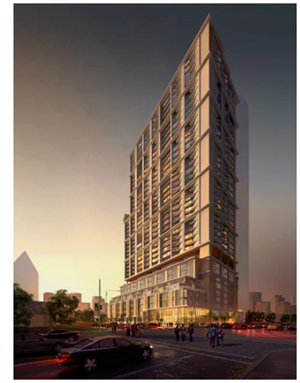 The arts district tower, to be on a one-acre site, will be the tallest of about a dozen new high-rise apartment buildings in development in central Dallas. Check out DFW Market Research​ for Office, Multifamily, Retail and more!